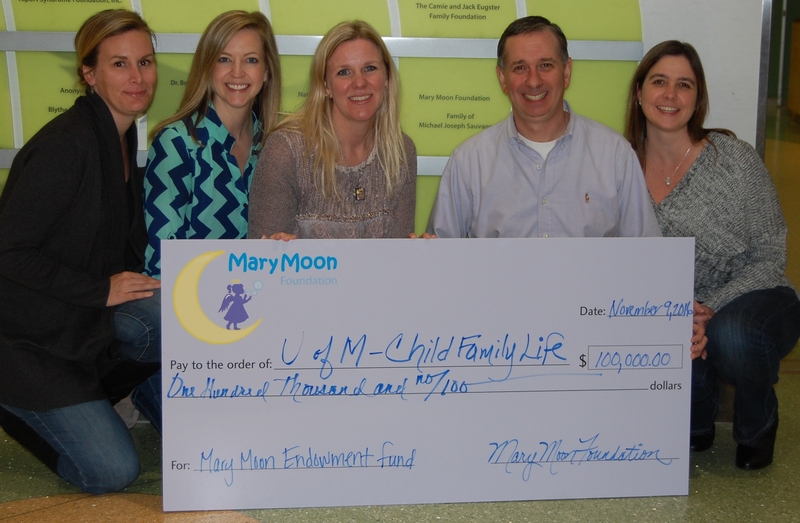 The Mary Moon Foundation is a non-profit organization based in Apple Valley, MN. On November 9th, 2016 the foundation celebrated its $100,000 milestone with the University of Minnesota Masonic Children’s Hospital. plaque in the lobby of the hospital! Christine and Peter with the plaque! There are many ways to support children who are undergoing frequent medical interventions. Individuals and groups are, thankfully, giving great effort to fund research in the struggle for causes and cures of serious diseases. The efforts of our foundation are to support children who have been diagnosed with these problems. Beds are currently occupied with young children who are fighting for their lives and are restricted from activities that promote normal childhood development as well as from their families and friends. Mary and her mother, Christine, enjoyed many activities during Mary’s hospital stays. Mary participated in the hospital’s beads of courage program, and Christine continued to add beads to make bracelets and necklaces with Mary during time at home. They shared their creations with families and friends. Mary was fortunate to have a strong family support team whether that was mom’s artistic ability to make things like a chandelier from construction paper and paper towel rolls, or Grandma Jackie bringing Legos and animal figurines. We also had many friends that supported us with games and activities to help keep Mary occupied and growing cognitively. 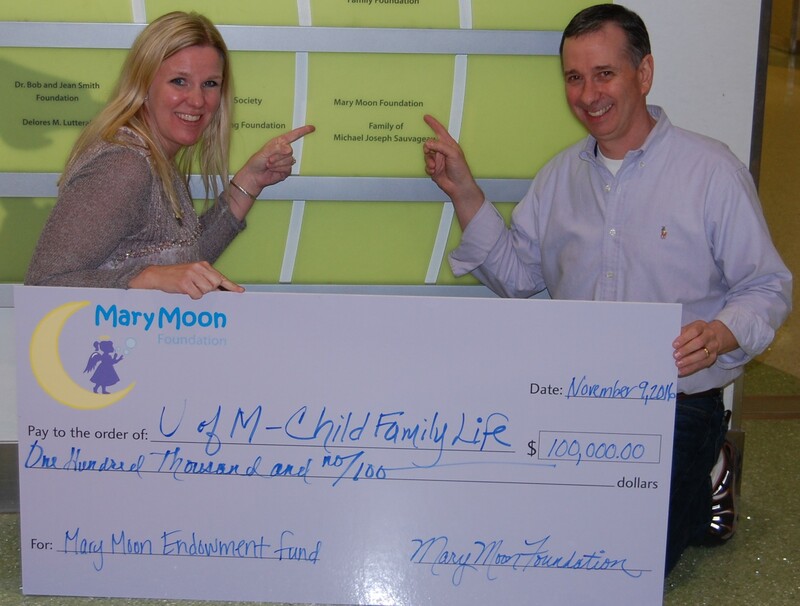 Today the Mary Moon Foundation supports two causes with the proceeds of our fundraising efforts; Crescent Cove and the University of Minnesota Masonic Children’s Hospital. Crescent Cove’s mission is to offer care and support to children and young adults with a shortened life expectancy, and their families. There are thousands of kids in Minnesota who have a life-threatening condition and need additional support. Crescent Cove provides support services to families to reduce pain, anxiety and stress and to enhance quality of life so that families can make every moment count. Crescent Cove is working to build the first residential children’s hospice home where children and families can come for short breaks, or as needed, as a sacred place at the end-of-life. It will be another option for care outside of the home or hospital. Nurse-led daily cares as well as music, massage, creative arts, spiritual care and hydrotherapy will be provided at the home. Parents and siblings will be able to stay or take a break and tend to other needs within the family. There are only two homes like this in our country, whereas, in the United Kingdom and Canada, there are many. Pediatric palliative care is growing in our country and this home will be a home-like, community-based place for families awaiting more support. Please join us in supporting Crescent Cove as they Promise Our Kids the Moon! The University of Minnesota Masonic Children’s Hospital has a variety of resources with which to help children. Their Child Family Life staff is excellent; they made incredible contributions during many critical moments of Mary’s treatment. As Christine and I listened to many doctors during the first periods of Mary’s diagnosis, you can imagine the fright experienced by all three of us. Mary was not feeling well, she was in an environment that could have been very scary, and Christine and I were in “new territory” in our role of being parents. The Child Family Life staff was right there to help us. With their calming demeanor and multitude of toys, dolls and other things, they helped to make Mary feel more emotionally at ease. When Christine and I observed that Mary was in good hands, it allowed us to better grip the situation and attend to the essential information the doctors were communicating. Since our very first days at the hospital, Child Family Life has been with us in all of the critical moments. They were with us the day we lost Mary, making a mold of Mary’s and Will’s hands next to each other. Then, a few hours later, they were with us in our grief as we needed to discuss funeral arrangements. I would like to say that Child Family Life has a boundless supply of resources, but these resources are not unlimited. The new hospital is spectacular, but I believe there are never enough resources to give to a child in a hospital. Mary’s longest stay during her year of treatment was nine weeks, that’s 63 days! You can imagine a three year old being in their bedroom for this length of time without leaving. How many times can they watch Tom and Jerry, build the same Lego set and play the same games? Mary’s family was very active with her, keeping her very busy; we were regularly buying new toys, have her open and explore them. Those were great moments. As she became tired of the toys, we would bring them home for a few weeks, only to have her see they as “new” when we brought they back. Christine and I were fortunate to have such great support from our family, friends and employers, we are very grateful. There are many children whose family and resources are much more limited. One child I vividly recall had no family members with him during much of the time; how sad for both he and for his family who were unable to be there. Many days this child sat alone at his door in a little red wagon with his IV pole. The nurses would place this three year old there so he could watch all the activities in the hallway. There is always a limit to what a hospital can provide. There is often a child going “without.” The impact made by Child Family Life (their people, activities and materials) is of great value to families. We want to help hospitalized children to be able to participate in normal childhood events and feel extra special. Learn about Mary and our precious time we had with her on our Journal page.